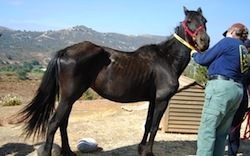 Animal Control Officers noted a number of horses were becoming thin and posted a notice at Patton’s property July 15 stating the animals would be seized if conditions didn’t improve. Patton requested a hearing to contest the proposed seizure. The hearing was held Friday, July 19 and the hearing officer’s decision Monday, July 22 authorized DAS to seize all the animals on the property. A total of 22 horses and foals, 8 dogs and puppies, 1 cat, 1 rabbit, 1 guinea pig and 3 mice were taken from the property. A veterinarian has examined the horses and found they were all below the proper weight and some needed dental care. Treatment is now underway. As part of the administrative process, Patton has 14 days to reclaim her animals if she shows she can provide the necessary care and attention for them and if she can pay the cost of their impoundment, housing and medical care. 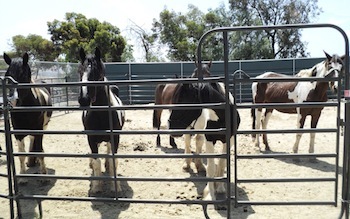 DAS seized 10 horses from Patton last May when the animals were found without food and water. Most of those horses have since been adopted.